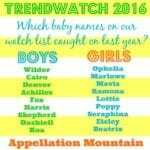 Last week was all about predicting baby name trends for 2016. It’s a tricky business, but it’s irresistible, too! 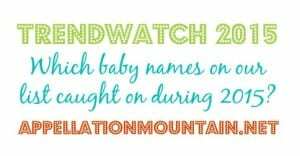 We all want to know what the future holds, especially if we expect to be choosing a baby name soon. 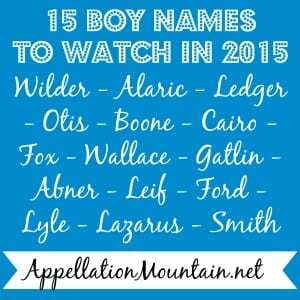 In 2014, I chose fifteen boy names and fifteen girl names to watch as part of my 2015 predictions post. This year, I thought I’d break them out into their very own posts: Trendwatch 2015 and Trendwatch 2016. Today we’ll take a look at how those names performed this year. And tomorrow? I’ll take my best guess at thirty more rising names for 2016. Note: 2014 data is released in May 2015, and 2015 data will be released in May 2016. So in terms of hard numbers, Trendwatch 2015 results are based on 2014 data. That said, I’ll also consider other factors – high profile birth announcements, new fictional characters with the names, etc. Wilder – My fa vorite preppy hellraiser name, bound to appeal to different parents for different reasons. This was a win, but only slightly. Wilder was given to 128 boys in 2014. It’s definitely one to keep watching in 2016, too. Alaric – It sounds like a Game of Thrones character, and there is a minor character by the name mentioned in the books. But mostly, I think this name succeeds on style – it feels like a forgotten name from history, and one that’s clearly masculine. (The most famous Alaric was a fifth century King of the Visigoths, famous for sacking Rome.) Alaric was given to 150 boys in 2014, a healthy gain. Ledger – Ledger is a surname taken from a given name worn by a martyred seventh century bishop. But Ledger owes its success as a 21st century baby name to the late Heath Ledger. It gained modestly in 2014, given to 177 boys. Otis – Otis isn’t just for hipsters anymore. 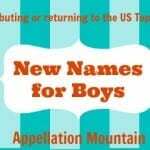 The formerly fusty name was given to 202 boys in 2014, a modest gain. Another boost for Otis? Hollywood. Tobey Maguire and Jennifer Meyer welcomed a son named Otis Tobias back in 2009. Olivia Wilde and Jason Sudeikis welcomed Otis Alexander in April 2014. Boone – Boone brings to mind the capable frontiersman Daniel Boone, and has a great, on-trend sound. It was given to 193 boys in 2014, another healthy gain. Cairo – It’s a place name with a vibrant ‘o’ ending, and a more exotic spin on Kai. That’s three reasons this name was given to 171 boys in 2014, a new high, and I think it’s one to keep watching in 2016. Fox – Part-Felix, part-X Files. And we do love a boy’s name ending in x. Fox was up to 163 newborn boys in 2014, a modest gain. But I think there’s more momentum behind Fox. Sneak preview: this one tops my 2016 Trendwatch! Gatlin – The early machine gun was a gatling, but drop the ‘g’ and you have a stylish – if aggressive – name. It was given to 157 boys in 2014, a modest increase, and names from weapons have become a curious trendlet. 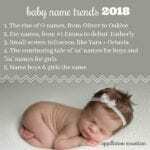 Abner – Biblical boy names are nothing new, and yet new choices from the Good Book are always surfacing. Abner is ready for rediscovery on the heels of Abraham, Abel, and Asher. It was up slightly, with 198 newborn boys in 2014. Leif – A Viking by way of Hollywood. In the first Trendwatch 2015 report, I wrote “just a few more boys could tip Leif into the Top 1000.” It happened! 205 newborn boys were named Leif, and the nam entered the US Top 1000 in 2014. Ford – Ford is a surname name with an Americana, can-do spirit, and celebrity baby name status thanks to Owen Wilson’s son. Ford was given to 244 boys in 2014, and also entered the US Top 1000. Lazarus – Another Biblical name with on-trend style. It rose slightly in 2014, given to 124 boys. Smith – It’s an everyman surname that could Jackson on the playground. And in 2014, there were 137 newborn boys given the name – a modest increase. Lyle – I’ve been listening for Lyle ever since I heard the name on a cute kiddo in the Detroit airport ten years ago. But Lyle was flat in 2014, given to 168 boys for the second year in a row. Wallace – I called it a gentle classic with ties to the Scottish hero, and called it “hard to believe Wallace isn’t currently in the Top 1000.” That remains true, and yet Wallace is the only name of the fifteen that actually fell! A great alternative to William, but one that hasn’t tempted many parents. Scorecard: Out of 15 predictions, 13 names gained, one was flat, and one fell. That 87% – not too shabby! Noa – Noah is a boy’s name – the #1 name in the US in 2013 and 2014. Drop the ‘h’ and Noa is a legit girls’ name, big in Israel, but still rare in the US. In 2014, Noa was given to 284 girls in the US, and cracked the US Top 1000. Landry – I’ve been watching Landry as one of the new unisex names, but for 2015, I gave this one to the girls. Sure enough, there was an increase to 269 newborn girls named Landry in 2014, and the name entered the girls’ Top 1000. On the boy’s side, there were 270 newborns – a slight decrease. Kensington – I called Kensington “part of the unstopped Ken/Kin trend,” though I think the sound might finally be losing steam. But with popular young royals Will and Kate and their pint-sized prince and princess in residence at Kensington Palace, this name will continue to be out there. It was up slightly, given to 229 girls in 2014. Clementine – I called Clementine the “female equivalent of Wallace – how can darling Clementine not rank in the Top 1000?” But while I was wrong about Wallace’s prospects in 2015, I was right on with this edible appellation. Clementine was up to 283 newborns in 2014, and entered the US Top 1000. Promise – It seems like a longshot, an overly dramatic virtue name. But I wrote, “with Trinity, Destiny, and Serenity cracking the Top 1000 in recent years, never count out a word name with a spiritual vibe.” Promise was up slightly, to 248 girls. Sylvie – This was a no-brainer, part-Sophia, part-Ava. And it was up to 226 newborn girls in 2014. This is absolutely one to keep watching in 2016! Zelda – I mentioned that this name was in the spotlight thanks to the daughter of the late Robin Williams – proof that tragedy can boost as easily as joy. The name rose – it was given to 212 girls in 2014. 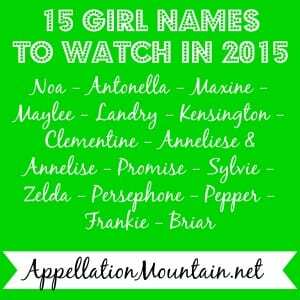 Persephone – We love those Greek girls’ names, like Zoe and Chloe. With Penelope rising fast, how could Persephone fail to garner more attention? It was given to 199 girls in 2014, an increase. Let’s keep watching this one in 2016, too. Pepper – I thought all of those Iron Man names might do it, but Pepper Potts didn’t quite push her spicy name into greater use. Then came another reboot of Annie, the enduring musical, and Pepper gained slightly – up to 157 girls in 2014. Another possible reason for the rise? We do love our girls’ names ending in ‘r’. Frankie – Drew Barrymore is an influential namer. First, she chose Olive and helped cement the peaceful, spare name as a rising favorite. Then came daughter Frankie, born in April 2014. 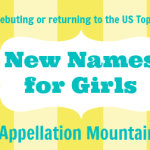 And the name was given to 213 girls – definitely climbing. Briar – Like Landry, I noted that Briar was used for both genders, but I expected to see it gain for girls in 2015. It did, rising to 155 girls. Part of my reasoning? Rachel Bilson and Hayden Christensen gave the name to a daughter in October 2014, full name Briar Rose. But Briar was also given to 199 boys, probably thanks to its membership in the Brian-Bryce-Bryson club. Anneliese, Annelise – Multiple spellings can be crazy-making! In 2014, I noted that Annalise was the fast-rising favorite, and that How to Get Away with Murder might make that spelling the clear favorite. Annalise was given to 693 girls in 2014, a slight increase. Annelise was flat – for the third year in a row! And Anneliese was down slightly. Maxine – I called Maxine “a sassy, retro choice ready for fresh consideration.” I still think that’s true, but the numbers aren’t with me. Maxine was down to 202 newborn girls in 2014, from 235 the year before. Maylee – With Haylee and Kaylee fading, I tapped Maylee as the likely successor, thanks to our affection for Mae names. It didn’t come to pass. 236 girls were given the name in 2013, and just 224 in 2014. Scorecard: Out of 15 predictions, 12 names gained, and three fell. (Well, that Anneliese/Annelise one was fuzzy, but I’m counting it as a fall.) That 80% – oh dear! I definitely did better with the boys’ names. Were there any names that you watched in 2015 that have caught on? What do you think I’ll be watching for 2016?